Compatible replacement part to fit with various Dyson vacuum cleaner models. A high-quality alternat.. This turbine head is a genuine spare part for select models of Dyson vacuum cleaners. .. Manufactured by Qualtex, this high-quality Turbo Brush Tool is designed to fit with various Dyson va.. 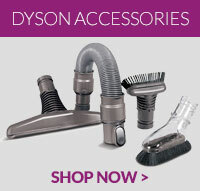 This item is a genuine spare part for select models of Dyson DC28, DC33, DC37, DC52, DC53, DC54 and .. This is a genuine spare part for select models of Dyson vacuum cleaners ..